Belly button piercing, also known as naval piercing is a kind of piercing which is done in or around the navel. Navel piercing has become pretty popular these days, especially among the young generation. It takes minimum 6-8 weeks to heal and it heals even more quickly if the pierced part is kept clean. In this type of piercing, the actual navel is not pierced. In fact, the most popular type of belly button piercing is through the upper rim of the navel. 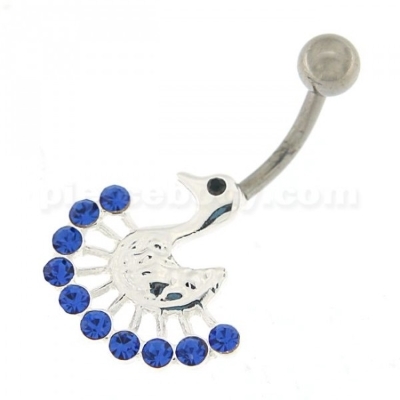 Various kinds of bar or ring jewelry are worn in a belly button piercing. Navel piercings are often done with simple curved barbells, captive bead rings or barbells with dangling pendants. Before you start with your piercing, you need to have some knowledge regarding the movement of the needle. So, it is better to use either a body ink marker to mark the exit or entrance locations of the needle. We would recommend having a gap of 1 cm between the piercing hole and navel. Mark the position in or around the navel where you want your piercing. You can use a hand-held mirror to see whether the marks are align properly. You should do this only in a standing posture. Put some antiseptic lotion or cream over the piercing area to prevent any sort of infection. If you are really scared of the pain, you can apply numb gel over the area where you want to do the piercing. Pinch the fold of the skin you want to pierce, with a piercing clamp. Stretch the skin taut properly and push the piercing needle through in a rapid motion, followed by the piercing jewelry which you want to wear. Make sure that the jewelry is in the right position by securing the end of the jewelry. Try to avoid wearing belts, tight jeans, pantyhose or skirts as they will cause friction with the jewelry thereby delaying the process of healing. You can also get your belly button piercing done by a professional! While choosing a piercing booth, make sure that the shop maintains high levels of cleanliness and the piercer possesses his own autoclave. A knowledgeable piercer will assist you in choosing the right type of dangle belly button rings to fit your belly button piercing that will be best for quick healing. Take deep breaths and relax completely during the procedure of piercing. Your piercing will also finish in a few seconds without causing you much pain.